Friday October 2 1908 I ironed in afternoon and Will and I went to town in the buggy I went up and spent the afternoon with Mrs Smith. We cam home before it was very late. 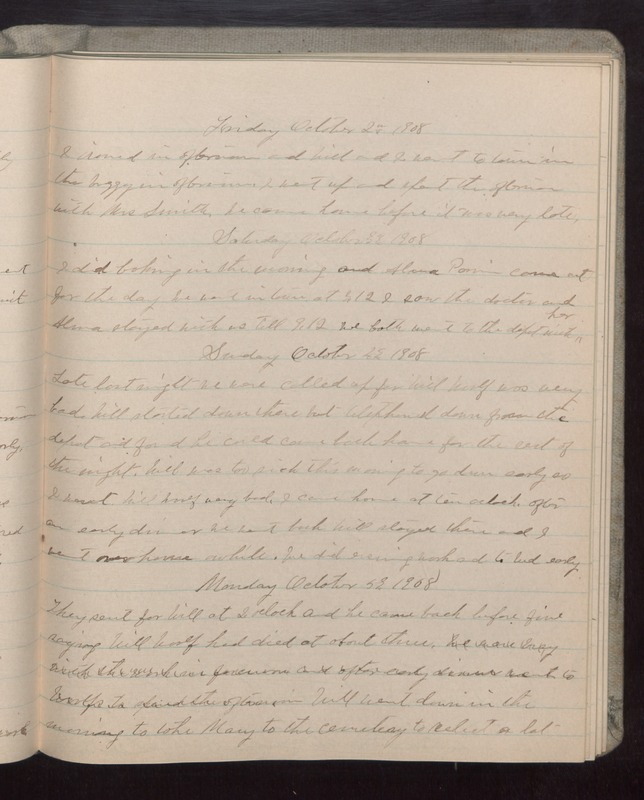 Saturday October 3 1908 I did baking in the morning and [Alana?] [illegible] came out for the day We went in town at 3.12 I saw the doctor and [Alana?] stayed with us till 9.12. We both went to the depot with her Sunday October 4 1908 Late last night we were called up for Will Woolf was very bad. Will started down there but telephone down from the depot and found he cold come back home for the rest of the night. Will was too sick this morning to go down early so I went. Will Woolf very bad. I came home at ten oclock. After an early dinner we went back Will stayed there and I went over home awhile. We did evening work and to bed early. Monday October 5 1908 They sent for Will at 2 oclock and he came back before gfive saying Will Woolf had died at about three. Will went down int he morning to take Mary to the cemetery to select a lot.